RevenueHits is a Contextual and Geo targeted ad network. Their performance based advertising helps webmasters to monetize their websites, blogs, toolbars search, widgets, IM applications and more. RevenueHits is owned and operated by an Israeli-based company which started in 2008. Their technology scans millions of ads and analyzes their performance overtime and they have a huge inventory of performance based (CPA) ads. RevenueHits receive more than 2 billion impressions per day and they assure that publishers will get 100% fill rate on all countries. RevenueHits' technology scan millions of online ads and analyze their performance over time. Their huge inventory of ads is comprised of effective text and display ads that promotes performance-based offers. By serving these proven ads, RevenueHits help their publishers increase revenue and improve their income. No, absolutely not. They are a very popular network with an alexa rank of around 3,000 which proves that a lot of publishers are using their platform. I have a print screen of my current balance and I actually earned it from referral commission. I'm going to post a payment proof once I receive my earnings through PayPal. My Current Balance for January 2016, payable by next month. My first payment from RevenueHits, received on Feb. 26, 2016. Publishers can choose any of Revenuehits' various banner sizes and formats that match their site to gain access to their huge pool of advertisers. Their algorithm will find the best performing offers for your site to optimize your earnings. These type of ads are image based and they are more profitable if you place them above the fold because this will maximize the ad visibility which will increase your conversion rate and earnings. Their are several sizes of banner ads available such as rectangular, full banner, leaderboard and etc. Pop Ups and Pop Under ads will help boost your revenue immediately especially if you're generating traffic from Tier 1 countries because the CPM rates are much higher from these countries. Their system will display it in a controlled way in order to optimize your performances. We all know that pop up ads are annoying so I would just recommend the pop under ads because they are less aggressive, they don't appear right in front of the user but instead they open in a new tab behind the current one. These ads are small rectangular ads that appear at the bottom part of the screen, it slides from the bottom of the screen with a close button. Using this will help increase your earnings. These ads will appear at the bottom part of your webpage, they are rectangular banner ads at the bottom of your site. These are full screen ads and are they look like pop up ads. 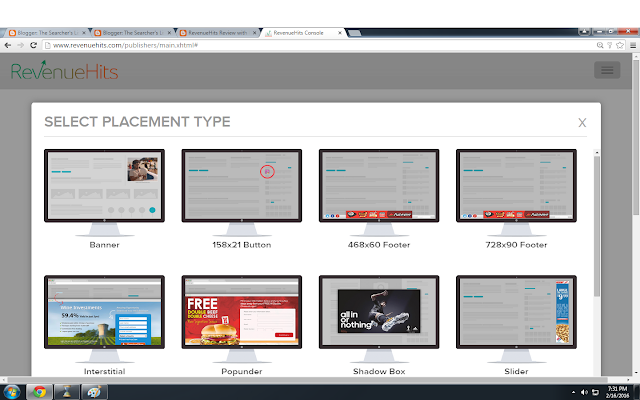 They appear between webpages and they cover the whole page with a close button. In addition to all standard formats, RevenueHits like to create custom formats according to their publisher's needs and requests. So if you want a customized ad, just contact their support and they will make it for you. Are they a good AdSense Alternative? RevenueHits have several ad formats to choose from and they also have instant application approval unlike AdSense so publishers can start implementing their ads right away after sign up without having to wait for hours to get approved. Their criteria for accepting new sites isn't very strict, even blogspot blogs like this can get instant approval when you apply. Some people think that ad networks who have instant approval aren't high quality, that's not true in the case of RevenueHits. They accept publishers who are just starting out and were rejected from very strict ad networks due to low traffic and several other reasons. They give these publishers the time to improve and grow their websites inside their network. They are a good AdSense alternative especially if you just got banned or having a hard time from getting your application approved by AdSense. Of course, the pay isn't as high as compared to AdSense but this network is a must-try for those who are having trouble with AdSense or those who just want to experiment on different ad networks. Traffic Source: If your traffic comes from tier 1 countries like US, UK, CA AU and other wealthy countries, then you will have higher eCPM (effective Cost Per Thousand Impressions) than getting traffic from 3rd world countries. Why? Because people in these wealthy countries have a higher standard of living so these traffic sources generally have a lot of potential customers which will increase your conversion rates and is good because RevenueHits pay for every conversion and not for every click. Traffic Quality: Even if your site doesn't get much traffic, you'll still make money as long as they get converted. Again, traffic from wealthy countries tend to convert better. Other publishers are saying that they get a lot of impressions and a lot of clicks but are only earning a few dollars, this is because you won't earn from clicks but from leads or actions taken by the visitors who clicked the ad. RevenueHits don't pay per click but per conversion/lead, that's why they call their ad network a Performance Based Advertising. The visitor must take action like download a software, sign up to a website or any other action in order for Publishers to earn from their ads. 1. Place tags that haven't been specifically approved for participation in their network on any publisher website. 2. Publishers must not place Network Tags on blank web pages or on webpages with no content (e.g. place banners on top of one another, so that more than 2 ads are next to each other), or place Creatives (ads) in a fashion that may be deceptive to the visitor in that it causes the Creatives to look like editorial content. b. Use unsolicited email to promote Creatives. c. Use auto-spawning browsers, or automatic redirection of visitors, blind text links, misleading links, forced clicks (i.e. requiring a visitor to click on a Creative because their browser has been hijacked, or because a Creative has been altered so that it's impossible to close without clicking it); or any other method that may lead to artificially high number of delivered clicks. Just refrain from doing the above listed restrictions to avoid your account from being locked and your earnings forfeited. 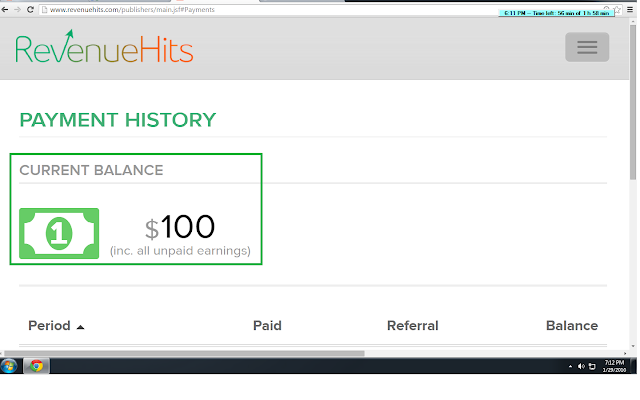 If you want to advertise on RevenueHits, you won't be able to do it directly on their site but instead you will be redirected to their division network called SelfAdvertiser.com. Their first minimum deposit is $100 and after that the minimum is $10. What can you say about this review? Leave your thoughts in the comments. I hope this won't ruin chances of securing Adsense in future? Of course it won't. Why would it? Awesome post about ad formats. I didnt know about the all formats available. Nowadays there are more advertising options and formats available due to the increased presence of mobile based advertising. Great review! thanks for sharing info. im using infolinks and i will test this ad network later. i hear that its the best adsense alternative. 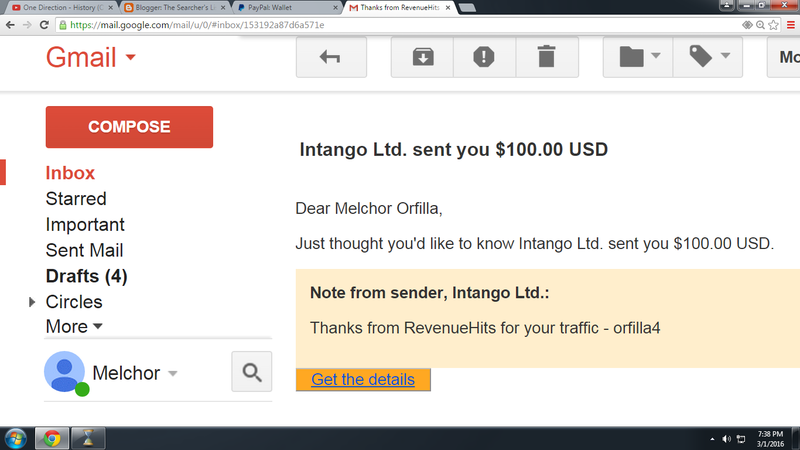 Yes, RevenueHits is one of the best AdSense alternative out there. Infolinks is a good alternative too. Are you looking to make money from your websites or blogs with popunder ads? In case you do, have you tried using PopCash? I've already tried Popcash, and their rate will depend on how much traffic you generate, the more traffic, the higher the rate. Traffic from tier 1 countries also have higher pay. But RevenueHits is still the better choice since it has a lot of ad types. Come and see how THOUSAND of individuals like YOU are making a LIVING online and are fulfilling their wildest dreams TODAY. Do you get paid by action? and what is the payment rate per action? Popup always occurs even after disabling it. why?